It's been a while since I wore a maxi skirt but when I went into Reiss and saw this one, with it's gradient colouring, I gravitated towards it immediately. I did try it on - something I never normally do (living on the edge people!) - because I was concerned that I would end up sweeping Dubai's floors with all the fabric but the length is actually perfect. It does hit the floor in flats but it doesn't drag around. I think the high-waist-to-floor length also make me look a little bit taller and I am all about that! In the ideal world I would wear this with a white/pearl coloured silk top. I don't own one of those yet so I played it safe with my white Zara shirt. It sort of works. Bag: Phillip Lim Pashli in Ink - Link! Sunglasses: House of Harlow "Chelsea"
After I picked up this skirt I went into Harvey Nichols for a little browse. One thing led to another and I decided to get my face matched at the MAC counter. I haven't tanned for months and the fake tan has been scrubbed off for a couple of weeks so I was interested to see what shade they thought my skin was. I was only wearing concealer (Armani Maestro - AMAZING) so now was as good a time as any. And the result? Apparently I am an NC20 - with a possibility to also sport NC15. NC15! I think it works great with the white shirt, keeps it nice and casual! Sure the white/pearl silk top will work equally well too though.The skirts beautiful! I know how you feel about the mac matching thing, I was horrified when I went from NC35 in England to NC25 after a year in Korea and far less sunshine that usual! Like you though, a few days in the sun and I need to pull out 30 or 35 again. Lovely skirt Laura, so beautiful! Gorgeous skirt, so perfect for Dubai! I've never really heard anything good about MAC foundations being matched I swear by my Bobbi Brown foundation which is a perfect match. This skirt is absolutely beautiful! You look great ! The last time I let a MAC MUA do my makeup.... I was too empbarrrased to walk through the mall to my car! I ran !!! You look amazing Laura, wish I could pull off this look. Unfortunately I haven't got the figure to tuck a shirt in but I adore this look! I really like the skirt on you - it seems like quite a different look on the blog but it definitely works. Also so nice to see a blogger having a good ol' grin! Too many fall for the model grimace. Wow I love the skirt! 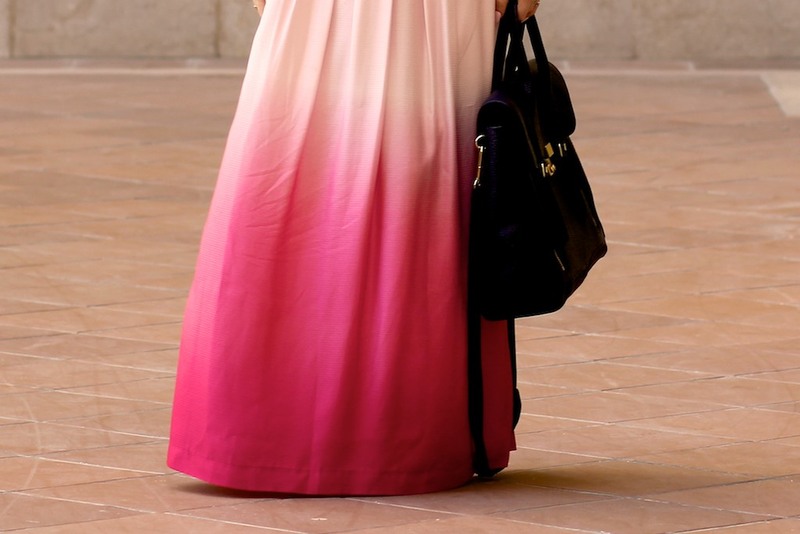 Maxi skirts always make people look taller and elegant. That skirt is beautiful! I love the way you've styled it too :) I really want to get it now but I'm so short I don't think I could pull it off.. Very nice skirt. I don't feel comfy in maxi skirts but you look good in it. Welcome to the NC20-but not for long club! I hover somewhere between NC20-25-27-30 depending entirely on the season, which is quite odd as I live in South Wales and our season is pretty much rain-snow-rain-snow-few days of sun! oh my goodness I love it so much!!! i loved this outfit so much! it's awesome! Such a pretty skirt! I love the gradient color. This is the most amazing skirt! Would be perfect if it was in a teal fade! Love that gradient of the skirt - beautiful! I think a pink top in the deep pink color at the bottom of the skirt would work a treat too! I'm in love with the skirt have to go get myself one ! #lifeofashoppaholic <3 Joues Rosees. The dip dye on this skirt is amazingly gradiated, I love it! I often have to switch up to NC30 in MAC with a tan, I recommend a try! I really love your outfit! So pretty. This one looks great on you Laura! It works really well with the white shirt, very smart casual! I can't wait to wear summery clothes again! It actually is snowing here in Switzerland today... Booh! you look stunning! i love how simple yet elegant this look is. Wow that skirt is amazing, so pretty and Spring-like, thanks for posting! Great skirt and love how you styled it. Top marks. Charming Karen millen dresses are great as you can dress them along. You can wear these to the beach or from a first date. Women's skirts are great as they are lightweight and easy that will put on. Stunning outfit! You look beautiful and super chic!! 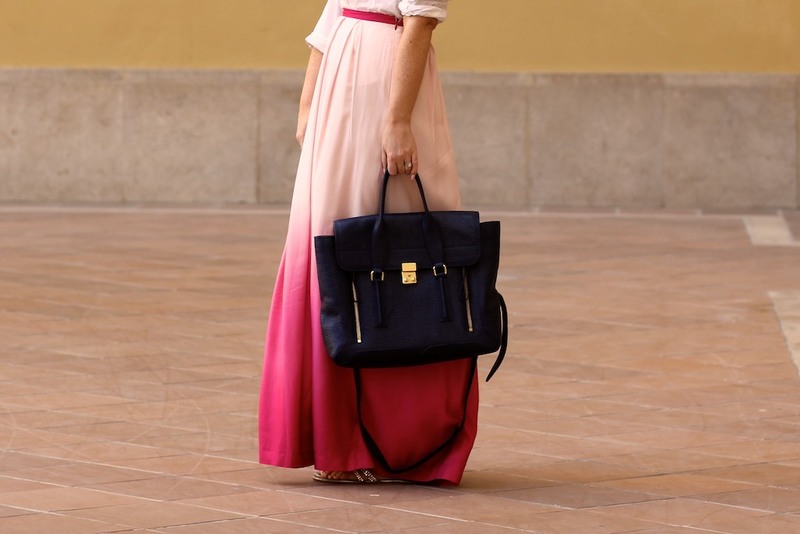 The maxi skirt is such an eyecatcher! Just can say: woow! This skirt is lovely, the colours are so pretty. Great find! This skirt is absolutely gorgeous!! I love so much your skirt!!!! You look stunning - love your philip lim bag!! Oh, that skirt is divine and you're doing a great job wearing it, as that kind of length and that much cloth can easily make anyone look smothered. It looks so nice paired with that shirt in the same shade of pale pink and I can't see it matched with anything else, so I am curious as to what other ensembles you have in mind for it.